"For as long as I can remember I’ve been looking up at the sky, especially at night. My parents used to rouse my two younger sisters and me awake to watch comets, lunar eclipses or meteor showers at all hours of the night, so astronomy has always been more than just a casual hobby for me; it’s a lifestyle. 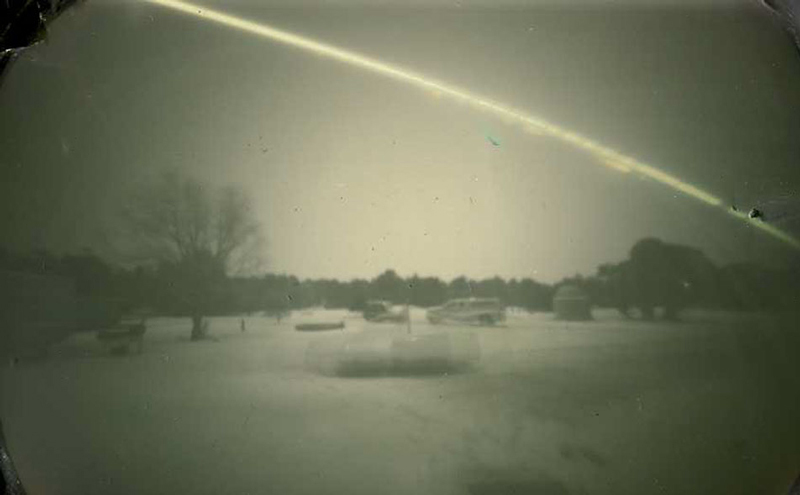 Another passion is pinhole photography, and when I discovered a way to combine astronomy with making pinhole images of the Sun’s path, (called solargraphs) it was a perfect match. 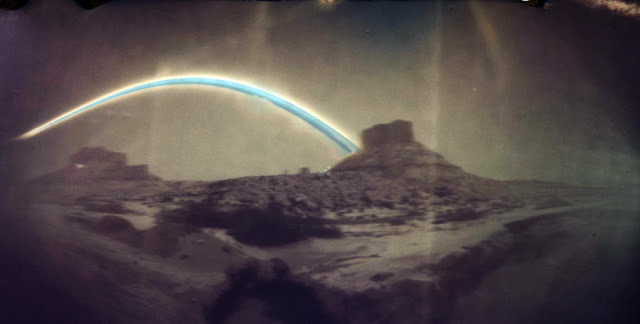 "My first long exposure pinhole solargraphs were only a few days long because I couldn’t stand the suspense of not knowing what was happening inside the homemade cameras I had made. After seeing my first few solargraph attempts turn out successfully, I was completely hooked! They gave me the confidence to let the exposures run for six months to capture the Sun’s path from summer to winter solstice. "It takes a little luck and a lot of patience to wait it out, but the final result is almost always worth it and always a surprise. You don’t ever know what you’re going to get because the weather plays such a big factor. Occasionally, crows get too curious and peck a camera apart and ruin it. It’s always a disappointment when that happens, but its part of the waiting game you have to play when making very long exposures out in the wild. "Since the pinhole camera is exposing non-stop for six months, dirt, rain, snow and bits of debris finds its way into the teeny pinhole and becomes part of the image. I like that aspect of this process because it’s a permanent part of the solargraph and makes each one unique. "A few years ago while traveling in Utah I decided to make winter solstice solargraphs since the Sun’s path is very low across the sky during this time. I found that I could include interesting landscape features in the image and this made the solargraphs more like mini documentaries of my winter vacations. The hardest part was leaving the pinhole camera in a somewhat public place to expose for nine days. I mainly worried about a snowplow running over it, or throwing so much snow on the pinhole camera that it wouldn’t expose at all. "My photographs comprise a solar diary, portraits of a moment in the life of our local star. Most are captured from my backyard in Buffalo, NY. My small telescope and narrow band filters can capture details in high resolution and record movements in the solar atmosphere that change over hours and sometimes minutes. The raw material for these images is black and white and often blurry. As I prepare the pictures, color is applied and tonality is adjusted to help render the features. It is photojournalism of a sort. The portraits are real, not painted. Aesthetic decisions are made with respect for accuracy as well as for the power of the image. "I've been interested in science since childhood. 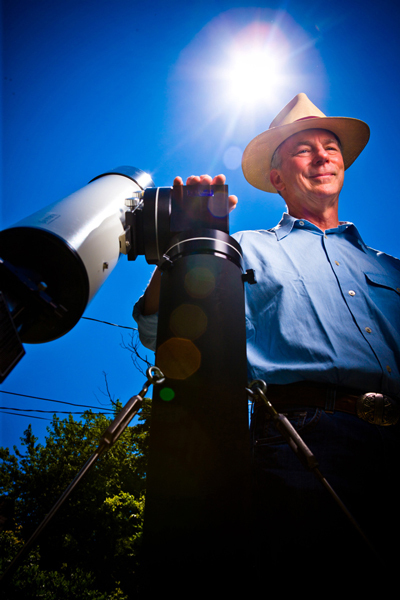 In the 1990s, a glimpse of Saturn through a neighbor's telescope stunned me. I bought my first telescope shortly afterwards. I've owned quite a few over the years following - I currently have six. I’ve been exploring the sun as a subject for photography for a little over a decade, or one solar cycle. A solar cycle lasts about eleven years, during which time the sun’s magnetic activity fluctuates from minimum to maximum and then back again. Blue Fireball, captured in 2009, shows the sun in the depths of the most recent solar minimum. The disk is completely spotless. 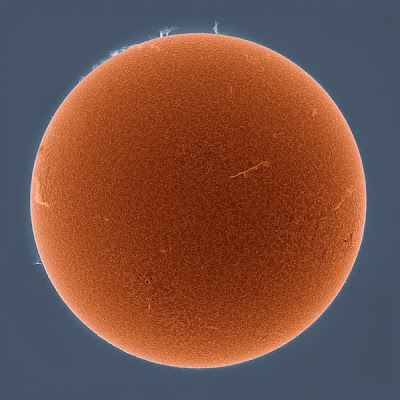 Only a few delicate prominences disrupt the total symmetry of a resting star. In Not the Great Pumpkin, recorded in 2010, a few very small sunspots can be seen, along with arching eyebrow shaped filaments. Filaments are prominences, but seen against the disk of the sun rather than at the limb. Captured this past summer, Hotter Than July shows the return of large eruptive active regions. These areas of magnetic upheaval create turmoil in the solar atmosphere. They can be massive, stretching hundreds of thousands of miles across the sun. Solar is on exhibit at photo-eye through the end of November and features the work of seven photographers. A portfolio of work from the show can be viewed here. For additional information about Alan Friedman or Becky Ramotowski or to acquire a photograph, please contact the gallery at (505) 988-5152 x202 or by email.